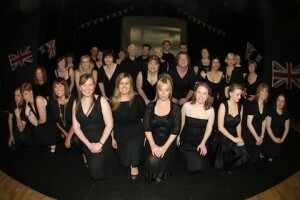 Guildburys were delighted to perform in Jubilation! at Guildford’s Electric Theatre on Saturday, June 2 – joining a cast of 60 local performers who created a fantastic nostalgic musical and theatrical journey through the past 60 years. A packed house enjoyed a show that began in the 1950s as Queen Elizabeth came to the throne, marking each decade right up to the present. Narrators set the scene for each decade with snippets of history, not only local to Guildford, but national and international; there was reference to the arts with music from each era as well as the dramas and stage shows enjoyed at the time. This was presented against a backdrop of vintage images of Guildford. The cast was drawn from members of local drama groups who are part of the Guildford Amateur Theatre Association (GATA). With only 4 rehearsals it was a wonderful show,with GATA members being joined by students who currently make up the Guildford School of Acting (GSA) Singers.